Whole-grains, yogurt and honey make Honey Cornbread taste so good! I used 2 kinds cornmeal for added texture, but you can use what you have on hand. The medium-grind is more coarse than enriched cornmeal. Place 10-inch cast iron skillet in oven. In a separate bowl, stir together cornmeal, flour, salt, baking powder and baking soda. Set aside. In another bowl, stir egg, milk, yogurt, oil and honey together until thoroughly combined. Add egg mixture to flour mixture. Stir just enough to combine. There may be visible flour lumps. Over mixing the batter will toughen the cornbread and cause tunnels to form in the bread as it bakes. Add butter to hot cast-iron skillet. Heat butter until brown and bubbly. Pour batter into hot skillet and return to middle rack in the oven. Bake until golden brown and a toothpick inserted near the center comes out clean, 18-20 minutes. Remove from oven. Note: If not using a cast iron skillet, use a 9-inch baking pan. 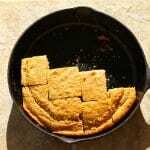 Lightly grease pan with cooking spray or melted butter. I used 2 kinds cornmeal for added texture, but you can use what you have on hand. The medium-grind is more coarse than enriched cornmeal. Bob’s Red Mill Medium-Grind Cornmeal is what I use. I love the texture it adds.